#22, "Sunny in Northern New Mexico" by Thomas Wejzak. 5. Ana Sharma, "Winter at River Walk"
11. 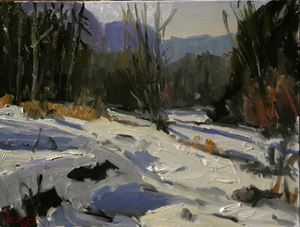 Patricia Rose Ford, Winter Along the Rio Grand- 8x15-Plein Air Pastel-Along the Rio Grand near Pilar, at about 20 degrees. 13. Reid Bandeen, Snow Showers Possible, 8x10 inches, Oil, Las Conchas Trail, Jemez Mts. 15. Rosie Sandifer, Dream Lake Day, oil-8 x 10...painted in Rocky Mountain National Park.- Estes Park, CO.....hiking 2 miles up to Dream Lake. 18. Karen DeBont, Quebrados Snow, 9"x12", oil. Location: Quabrados Backcountry Byway looking west toward Socorro Peak. 21. Ruan Bacigalupa, San Ysidro Church - Corrales NM, Oil on canvas 10.5" x 13.5"
25. Richard Szkutnik, Winter at Hollowell Park oil on panel 20" x 16"
27. Susan Winkler, Winter cactus garden in Tucson, 1/14/15. 14 × 14 oil on masonite panel.